McLaren drivers Lewis Hamilton and Heikki Kovalainen will be letting the Monaco Grand Prix go to their heads – by once again wearing helmets decorated with Steinmetz diamonds. Last year the duo had bash-hats bearing their signatures picked out in sparkly stones. This year Lewis, as world champion, gets a blingy number one. Hamilton said of the tie-in: “I think every Formula 1 driver really cares about the design on their crash helmet. My helmet is yellow because my dad wanted to be able to see me clearly when I was karting and I was on the far side of the circuit: he wanted to know that I was all right. “I’ve hardly changed the colour scheme of my helmet since then and I really love it. 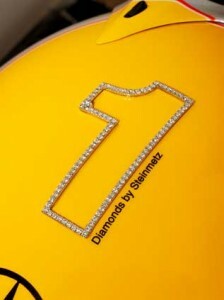 The Steinmetz diamond number one I’ll be wearing in Monte Carlo this weekend is a fantastic way to commemorate the most prestigious race on the Formula 1 calendar, and my favourite racetrack in the world. The McLaren press release also reveals that Hamilton’s thank-you from the sponsor for winning last year’s race was a Steinmetz diamond racing ring. Perhaps 2009 is not their best chance of doing that, or indeed Steinmetz’ for flogging luxury goods, but McLaren fans everywhere can be hopeful. Because we have long memories, we can’t resist warning Lewis and Heikki not to put them down on the garage floor while they pop off for a ‘comfort break’. Steinmetz has worked successfully with McLaren for the last four years – but before that came the unfortunate tie-in with Jaguar that saw a diamond worth more than £150,000 attached to the nose of Christian Klien’s car in 2004 to promote the launch of the film Ocean’s Twelve. Only trouble was that Klien crashed on his first lap, knocking off his nosecone, and the stone was never seen again. Categorised under F1, tagged under Formula One, Heikki Kovalainen, Lewis Hamilton, McLaren, Monte Carlo Grand Prix. F1: Is this the 2009 championship-winning car?